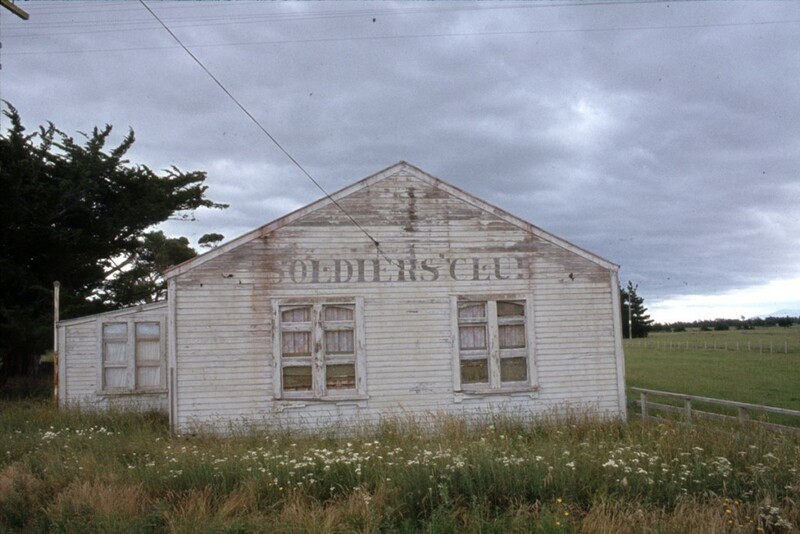 Part of the YMCA Soldiers’ Club at the Featherston Military Camp was later used as the Kaiwaiwai Hall, South Featherston. Another part was used for the Kahutara Hall. When World War One ended on 11 November 1918, the camp was in the middle of the influenza epidemic. Training stopped at once and the Wairarapa camps began to empty. The army took some time to decide its future. Some buildings were removed quickly but the dismantling of Featherston Camp went on for over 10 years. After military training ceased Featherston Camp had various temporary inhabitants. Over 300 prisoners and internees arrived from Somes Island in December 1918. They were gradually returned to their own countries but some remained until 1920. Soldiers and civilians with tuberculosis (TB) were accommodated in the camp hospital for some months in 1919. A small group of soldiers with VD arrived at Featherston in December 1918. The buildings at Papawai Camp and some at Tauherenikau were quickly sold and removed. The Tauherenikau site was used as a training farm for returned soldiers with TB or chest problems, operating until 1923. Some Featherston buildings were removed quickly. They went to other military bases and a few became drill halls in North Island towns. Kahutara and Kaiwaiwai halls in south Wairarapa were both parts of the Soldiers’ Club. Other buildings went onto Wairarapa farms and local towns. For several years, the Defence Department retained the camp as a storage depot but a new plan for army bases in New Zealand made Featherston Camp surplus. Many of the buildings were demolished for the timber and, by 1930, there were only concrete foundations where once there were over 250 buildings and 8,000 men in training. The railway siding was lifted in 1927. The Defence Department kept the land. In 1942, when Japanese prisoners captured in the Solomon Islands were about to arrive, the army used the site for a prisoner of war camp. This remained until the war ended in 1945. In February 1943, a prisoner uprising resulted in 48 prisoners and one camp guard dying. The camp was used as temporary accommodation for dairy workers and tunnellers working on the new Rimutaka Rail Tunnel. A few buildings remained until the 1980s. A memorial park on State Highway Two is opposite the camp site, recalling the training camp in World War One and the prisoner of war camp in World War Two.